How Can Web Video Help Search Engine Rankings? Web video is a great tool to help boost search engine rankings. And you also get the benefit of video searchers viewing your video and having the ability to then link to your site! Here's how it works. 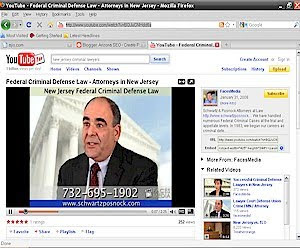 The above is a page at YouTube I arrived at after typing in 'new jersey criminal lawyers' and then clicking on David Schwartz' listing (which by the way came up as # 1, 2 and 7!) As you can see, his video immediately starts playing for the user to listen to. What also happens is that in the right column there is a small bio which contains a link to the website of these New Jersey Criminal Lawyers. We all know how Google loves incoming links so you have provided users with a chance to view this informative video as well as make Google happy with yet another incoming link to your site. Its a win-win any way you look at it. To make things even a little sweeter, their video shows up in the right column under 'Related Videos'. To view how this works in real time, just click here. Need help implementing a professional video to appear at your site as well as at the video search engines? Just contact us -- we've been sending New Jersey Lawyers to the TOP since 1996.